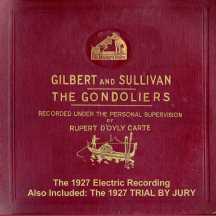 In 1927, D'Oyly Carte and HMV launched a new series of electrical recordings. All three of the sets that began the series—the Mikado, The Gondoliers, and this Trial—have stood the test of time and are among the best ever made. 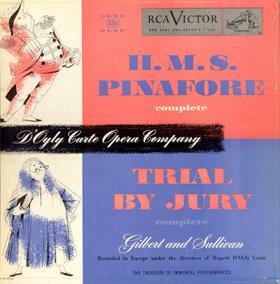 Surprisingly, while most of the other operas had by now been recorded at least once, this was the Company's first recording of Trial. The main attraction is Leo Sheffield's bouncy, idiomatic Judge, which has probably never been equaled on record. Overall, if one can tolerate the lesser sound quality of an old recording, this may be the best Trial on record. As shown below, there has been no shortage of re-issues. This is a set I and, I am sure, hosts of others had been wanting badly for years. 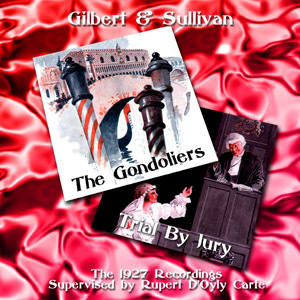 Trial by Jury has the unique advantage that it can be recorded as a perfect whole, there being no dialogue, but apart from that contains passages of beauty and of wit that make imperative its inclusion in the collection of Gilbert and Sullivan albums. 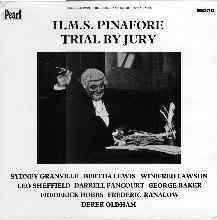 I still have an old and excellent Columbia record of the Judge's Song by Walter Passmore, which Sheffield's, good as it is, cannot supersede, but there are others for which we have waited in vain, for example the defendant's When first my old, old love I knew. For recording purposes principals of the standing of Derek Oldham and Winifred Lawson are included in the cast, which is all Savoyard — George Baker may be considered an honorary member by now. 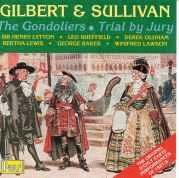 But I prefer to think of Trial by Jury as a concerted whole rather than a work consisting of separate numbers; "dramatic cantata" is the description on the title page of the libretto. Listening to these records I notice with delight many charming touches from the orchestra and chorus, such as the semi-ecclesiastical greeting to the Judge, that escape notice in the theatre, the more so since there Trial by Jury is but a prepiece to Pinafore or The Pirates. The discerning, however, have always looked upon it as a gem rather than a rag. It is not worth while mentioning a few small faults, on which opinions will certainly vary; it is better to praise the performance and recording in general, of soloists, ensemble, chorus and orchestra. 9318/21 in Album AC-4 Slide auto side couplings. Bruce Miller points out that the number "AC-4" wasn't actually used in the first RCA Victor catalog that offered this item. It is not clear when the "AC" numbering came into use. 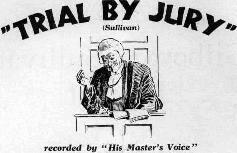 The table above suggests that Trial by Jury was one of the smoother recording projects that the company undertook in the early days. No matrix number has a take number higher than 2, suggesting that every selection was able to be recorded without the need for make-up sessions — a rare occurrence for a D'Oyly Carte set of this period.